One of my goals for the year was to make more gifts. Not because I necessarily think it saves money. My reasons were this. I see A LOT of projects that I want to make or try and I wanted our gifts to be more meaningful and thought out. We all get so much stuff, and I just didn't want to keep handing out more stuff, crossed off a list or rushed out and bought on the way to a party. It means I have to think ahead more. Look at what's coming up and plan. Which is a good thing because I also really want to shop more on Etsy and you have to think ahead to do that so you can accommodate shipping times! So this is what I finished this week, which totally impresses me, i can't believe how productive I've been....I must have ignored something else! 1. 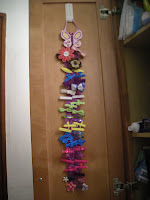 Barrette Holder; I saw these at a craft fair last summer and thought, I can make that. Ugh, I could, but I don't like the way this one came out. I choose the smaller butterfly because it's hanging in a cabinet, but I think a bigger one will look better and am going to find one and re-do this. I also don't like the paint job, I think it would look better reversed with the base being purple. Finally I had no idea we had so many barrettes, organizing them makes it so much nicer! 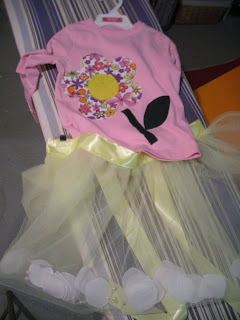 So next time I am going to do two ribbons. My daughter of course cares not. She is in LOVE with it. She is finally letting me do her hair again and the first few days had to have the door to the cabinet open whenever she was in the bathroom. 2. I did get these hung, but I don't have a picture and my computer is being SO SLOW today, so I will add this to next weeks post. 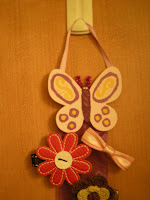 I found some lady bug buttons that I added to the leaf after I took this picture, but none of the pictures came out. But I wasn't! I'm in love with it! I know have two sicks kids and need to spend the weekend disinfecting the house (again! This has been the worse winter). So we will see how productive next week is! * all images property of PeanutbutterinmyHair not to be copied or distributed without permission. 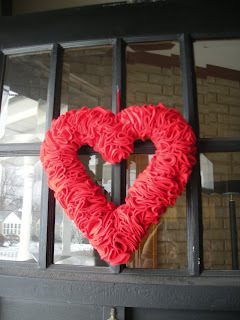 I LOVE that heart wreath! I want to learn how to make that! !